A Special Field Dispatch – Piippa Tandefelt! Hey ho, Funny Names Fans! A ‘special’ report here from the field in lovely Finland, where on a wander around the scenic Suomenlinna island fortress yesterday we ran into a lovely name – Piippa Tandefelt. 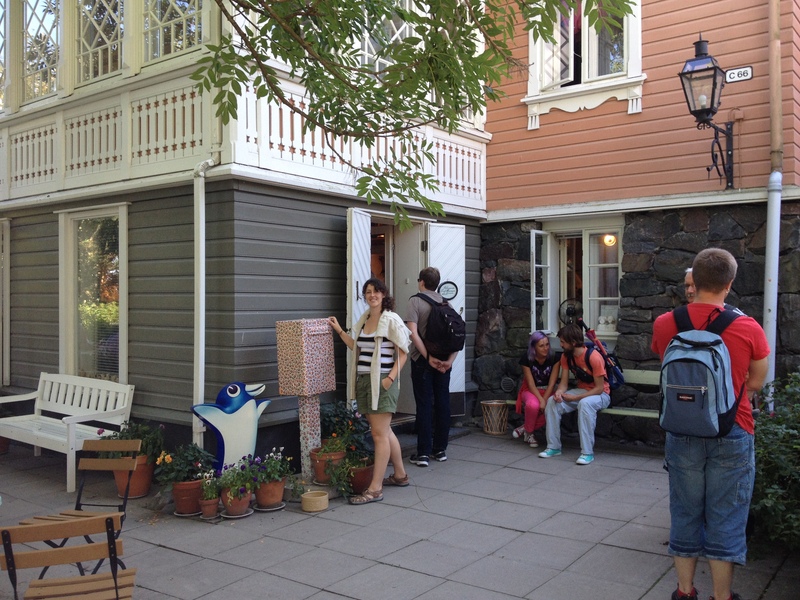 Piippa is the creator of the Suomenlinna Toy Museum, a beautiful house showcasing the history of toys, including some rarities, weird little things, and toy monkeys from as far back as the early 19th century. It’s full of all sorts of toys and dolls and things – they weren’t playing around when gathering up the collection! But more importantly for the audience of this blog, it was founded by Piippa Tandefelt. She was born in 1939 and bought her first toys for her daughter in the early 1960s. She eventually worked as a ceramic artist, getting an inside look at the sometimes elaborate methods of toymaking that yielded some of the more splendid items in her collection. Leslie posing in front of the toy museum, next to a blue penguin and a steady stream of German tourists. She started collecting antiques in the 70s, partially as a response to the single-use craze of the time, of plastic furniture and buying everything new. The toy museum was founded in 1985 in the cellar of the family’s house and it’s been there in the spot ever since, attracting tourists from all over the world, particularly Germany if yesterday’s sample was in any way representative (then again, from my experience there’s no place you can go in the world where a group of German tourists isn’t already there waiting for you). If you’ve ever wanted to see some really old teddy bears on a historical island fortress, stop by there when you’re in the neighborhood. I don’t know if there’s any other place you can. Also, the cinnamon buns in the cafe are pretty damn tasty. Grab one of those too. And get me one if you can. Mmhmm. 3 Responses to A Special Field Dispatch – Piippa Tandefelt! So awesome, and glad to know you’re alive and well in Finland!!!!! P.S. Do you want me to buy Jenny Lewis tickets for you and Leslie, or perhaps just buy them for you and me? The show is in late October.